To help ensure your business is honoring your prospect & clients’ wishes and improve your team’s efficiency we’ve implemented a new “Unsubscribe” feature that relates to a few different areas. The recipient will be taken to a page where they can drop you a quick note as to why they are unsubscribing and confirm the action. The Scheduled Email’s parent contact record will be added to an “Unsubscribed” Category Tag. If the tag does not exist it will be created. 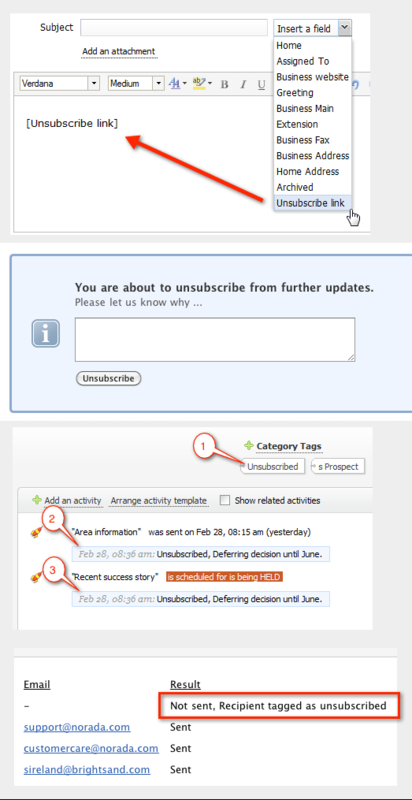 The Scheduled Email activity that the recipient unsubscribed from will have a message attached highlighting the details. All other Scheduled Email activities will be placed on HOLD. The creator of the scheduled Email activity will receive an email notification. [Unsubscribe link] field inserts a long web address e.g. https://secure.solve360.com/unsubscribe/c51527eae58893fbf3f4f7223f8f1e88 You can beatify this by tweaking the HTML source e.g.